These tiny lithium ion jump starters are perfect for carrying around as an emergency jump starter. 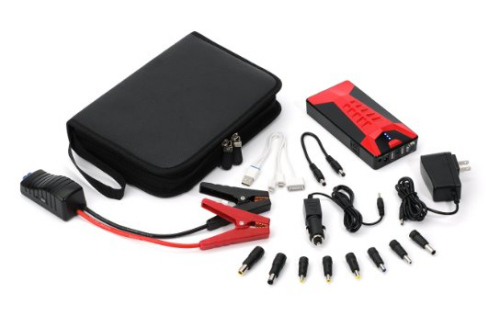 Weighing around 1 pound, they are as convenient as it comes – making them an obvious choice for a motoring gift in comparison to their larger alternative, the lead acid jump starter. Don’t be fooled by their tiny size though, these tiny jump starters are just as capable of starting any vehicle as any consumer level lead acid jump starter. You can even get as many as 20 jump starts on one charge with these clever devices. For a full (and rather scientific) explanation of the various types of Lithium battery, see the The Battery University. Lithium jump starters are roughly the same size as a standard torch, so it makes sense that lithium jump starters have a torch facility right? This is actually a very handy function; obviously if you get stranded very early in the morning while it is still dark, you don’t want to be digging around trying to find a torch AND a jump starter, so having a torch facility built in is a great idea. Some manufacturers have gone a step further and added a variety of settings for the torch, like SOS strobe etc. This is great of you are stranded at the roadside for whatever reason, to alert oncoming cars of your plight. You can see the Brightech Scorpion torch in action on youtube, where you can see the torch, strobe flash, and emergency flash in action. One of the great features that comes with all lithium jump starters is the ability charge gadgets. Battery life for gadgets is a source of constant frustration for smart phone users, mp3 players, mobile gaming devices, laptops and tablets. As these devices become smaller and smaller, so the batteries reduce in size, and the more often they will need re-charged. This is where a lithium jump starter can come to the rescue, bringing your gadgets back to life long enough to get you home, from the convenience of the glove box or trunk of your car. 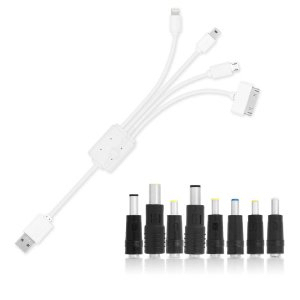 Some lithium jump starters come for a large selection of adapters so that the device will bring many types of laptop back to life, while others focus on providing a selection of phone cables. The PowerGo for example, comes with no less than eight adapters for charging laptops and seven for the most popular phone models. A carry case for your new jump starter may not be at the top of your wishlist, but it does keep the device free from scratches, and protects it from the risk of damage. That being the case (forgive the pun), you would expect a case to be provided with all lithium ion jump starters but this is not the case! Even the best lithium jump starter (in our opinion), the Powerall, does not come with a case (you can buy one that fits perfectly here though). The brightech on the other hand does come with a zippered case. All Lithium on jump starters come with a Power Indicator that warns when the device is in need of a re-charge. Typical usage for any jump starter means that it can lay in storage for long periods of time until it is called to duty to help start a stubborn dead battery. For this reason it is important that the device has a charge indicator, to see at a glance if it still has enough juice to kick start your vehicle back to life. The Powerall for example, has 5 charge indicator lights that advise on the unit’s current capacity. While the Powerall is plugged into an AC supply for charging, all 5 lights will come on in sequence to indicate charging. Once the unit reaches full charge, all 5 lights remain on, as detailed in the above chart. The Brightech Scorpion has a similar system but only has 3 indicators. The instructions for the Scorpion advise that all 3 bars are required before attempting to jump start a vehicle, however we have had success when only 1 or 2 lights or lit. Your mileage will vary (forgive the pun), however as with all jump starters, it pays to keep them fully charged with a top up charge every few months. Typically these jump starters have a longer guarantee period than a Lead Acid jump starter, check the manufacturer’s site for details. The Brightech Scorpion jump starter comes with a huge 3 year warranty. The Powerall jump starter comes with a one year warranty. The PowerGo jump starter comes with a one year warranty. 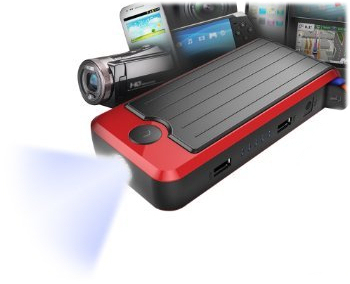 These devices are so portable that they achieve higher customer satisfaction than a comparable lithium ion jump starter. Check our satisfaction pie charts on each review page for exact details on how customers like or dislike their jump starter.